One Step Checkout Magento Extension - CODELISTPRO | Free Premium Scripts, Plugins, Apps Source Code. As per the market survey the average abandoned cart rate is over 66%? Many customers abandon online shopping at the checkout page due to a complicated process. 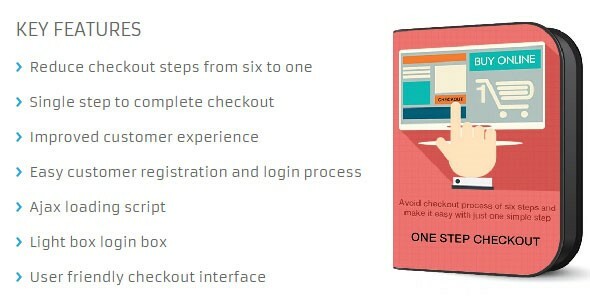 To Improving the customer checkout experience we have cumulate the Magento default 6 steps checkout process in single step. By using One Step Checkout extension! All checkout information such as billing address, shipping and payment method will be displayed together for customers to fill in/ correct information any step. You will be amazed at the significant increase in your store’s conversion rate after installing our One Step Checkout extension.